As early as a child, Birgitta had visions. 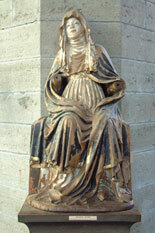 Once she saw virgin Mary who was placing a golden crown on Birgitta´s head. After her husband Ulf died in 1344, she had great visions which were written both in Swedish and in Latin. Birgitta got a mission from God to establish a new abbey for both monks and nuns. "a new vineyard!" The rule was dictated by Christ himself to Birgitta. Birgitta´s revelations were also about her contemporary time. She often commented on political questions. She criticized kings and demanded that the Pope, who was living in Avignon in France, would move back to Rome. The first printed edition of Birgitta´s revelations was published in 1492.